Supporters of nuclear power like to argue that nukes are the key to combatting climate change. Here’s why they are dead wrong. Nuclear fission is the most water intensive method of the principal thermoelectric generation options in terms of the amount of water withdrawn from sources. In 2008, nuclear power plants withdrew eight times as much freshwater as natural gas plants per unit of energy produced, and up to 11 percent more than the average coal plant. 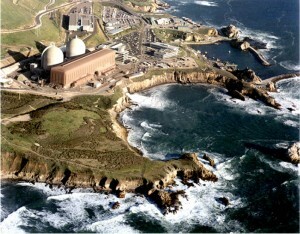 Every day, large reactors like the two at Diablo Canyon, California, individually dump about 1.25 billion gallons of water into the ocean at temperatures up to 20 degrees Fahrenheit warmer than the natural environment. Diablo’s “once-through cooling system” takes water out of the ocean and dumps it back superheated, irradiated and laden with toxic chemicals. Many U.S. reactors use cooling towers which emit huge quantities of steam and water vapor that also directly warm the atmosphere. These emissions are often chemically treated to prevent algae and other growth that could clog the towers. Those chemicals can then be carried downwind, along with radiation from the reactors. In addition, hundreds of thousands of birds die annually by flying into the reactor domes and towers. The temperature increase in the bodies of water can have serious adverse effects on aquatic life. Warm water holds less oxygen than cold water, thus discharge from once-through cooling systems can create a “temperature squeeze” that elevates the metabolic rate for fish. Additionally, suction pipes that are used to intake water can draw plankton, eggs and larvae into the plant’s machinery, while larger organisms can be trapped against the protective screens of the pipes. Blocked intake screens have led to temporary shut downs and NRC fines at a number of plants. All nuclear reactors emit Carbon 14, a radioactive isotope, invalidating the industry’s claim that reactors are “carbon free.” And the fuel that reactors burn is carbon-intensive. Themining, milling, and enrichment processes needed to produce the pellets that fill the fuel rods inside the reactor cores all involve major energy expenditures, nearly all of it based on coal, oil, or gas. As for the high-level waste, this remains one of humankind’s most persistent and dangerous problems. Atomic apologists have claimed that the intensely radioactive spent fuel rods can somehow be usable for additional power generation. But after a half-century of efforts, with billions of dollars spent, all attempts to do that have utterly failed. There are zero successful reactors capable of producing more reactor fuel than they use, or able to derive more energy from the tens of thousands of tons of spent fuel rods they create. Some reactors, like Fukushima, use “mixed-oxide” fuels that have proven to be extremely dirty and expensive. It’s possible some of this “MOX” fuel containing plutonium, actually fissioned at Fukushima Unit Three, raising terrifying questions about the dangers of its use. The mushroom cloud that appears on video as Fukushima Unit Three exploded stands as an epic warning against further use of these impossible-to-manage fuels. The MOX facility under construction near Aiken, South Carolina, is now projected to require another ten years to build with another ten possible after that to phase into production. 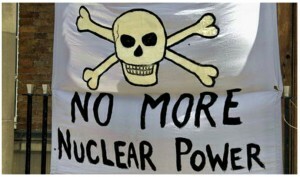 U.S. Secretary of Energy Ernest Moniz said on September 13, 2016, at the Carnegie Endowment for International Peace that the mismanaged project was “impossible” to carry out and that it could cost $30 billion to $50 billion. Even the current pro-nuclear Congress won’t fully fund the project and the Department of Energy DOE continues to recommend abandoning it. There are no credible estimates of the global warming damage done by the intensely hotexplosions at the four Fukushima reactors, or at Chernobyl, or at any other past and future reactor meltdowns or blowups. But a series of disastrous events in February, 2014, led WIPP to stop accepting wastes—the sole function for which it was designed. Most significant was an explosion of radioactive waste materials (The theory that the waste was mistakenly packed with organic rather than clay-based kitty litter has been widely accepted – but it has not been proven). 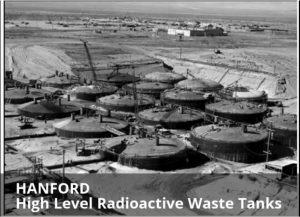 Twenty-two WIPP workers working above ground at WIPP tested positive for internal radioactive contamination. The entire facility remains closed. In a phone interview, facility management told me it may again accept some wastes before the end of this year. But at least part of the cavernous underground labyrinth may never be reopened. The Los Angeles Times estimated the cost of this single accident at $2 billion. 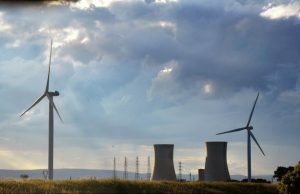 Overall, the idea that atomic power is “clean” or “carbon free” or “emission free” is a very expensive misconception, especially when compared to renewable energy, efficiency, and conservation. Among conservation, efficiency, solar and wind power technologies, there are no global warming analogs to the heat, carbon, and radioactive waste impacts of nuclear power. No green technology kills anywhere near the number of marine organisms that die through reactor cooling systems. No terrorist will ever threaten one of our cities by blowing up a solar panel. But the nuclear industry that falsely claims its dying technology doesn’t cause global warming does threaten the future of our planet.